Wall Street Journal–Plenty of Jobs, Not Enough Workers? Plenty of Jobs, Not Enough Workers? 16 out of 24 graduated. Have we really gotten to the point where blue collar employers aren’t willing to invest even ten weeks in training new workers for high-skill entry level positions? Since the economy bottomed out in mid-2009, the number of job openings has risen more than twice as fast as actual hires, a gap that didn’t appear until much later in the last recovery….If the job market were working normally — that is, if openings were getting filled as they usually do — the U.S. should have about five million more gainfully employed people than it does, estimates David Altig, research director at the Federal Reserve Bank of Atlanta. That would correspond to an unemployment rate of 6.8%, instead of 9.5%. ….Researchers at the Federal Reserve have estimated that [unemployment] benefits could account for between 0.4 and 1.7 percentage points of the unemployment rate. That doesn’t cover the 2.7-percentage-point gap between the current jobless rate and what Mr. Altig’s analysis of job openings suggests the rate should be. But on the other hand, the examples they come up with are pretty lame. So what’s up? Even if there’s a shortage of high-skill workers, that’s a long-term problem, not something caused by the recession. 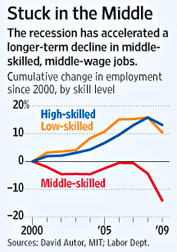 In fact, as the chart accompanying the story shows, the number of high-skill job openings has declined since 2008. At the very least, then, companies should be having an easier time — slightly easier, anyway — filling their open positions unless either (a) they’ve lowered their wages or (b) high-skill workers are literally retiring en masse. Whatever it is, something doesn’t quite add up here.